Journalists are taught to “peg” our stories to something. We mustn’t just wade into a topic for no reason but should reference a breaking-news development to explain why in the world we’re writing a particular story. It would be perfectly OK to compose a “sidebar” about, say, marshmallows if a marshmallow factory has just exploded. “Marshmallows Through the Ages”: a soft story for sure. But absent a catastrophe, who in the world would be curious enough about marshmallows to read a story about them? We’d need a peg, a hook, a grabby “lead” to draw people in. Or a coupon for free samples. Since I haven’t found that newsy peg to introduce today’s topic, you may already be gone. 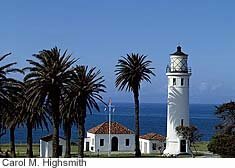 But look what you’re missing: some thoughts about lighthouses. 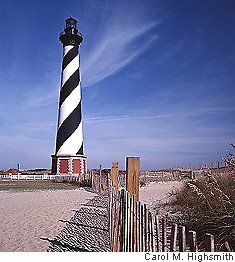 So far as I know, no lighthouse of any stature has recently collapsed, washed away, been moved from the encroaching sea as the magnificent Cape Hatteras Light in North Carolina was in 1999, been visited by President Obama, or has anything to do with marshmallows. I just love lighthouses so. Lots of people do. It has been said that lighthouses, probing the eternal, mysterious sea, are to America what castles are to Europe. Satellite and navigational aids have rendered lighthouses obsolete to big shippers and sophisticated recreational mariners. 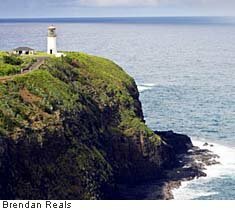 But to owners of small boats, a lighthouse is still a valuable visible aid, a welcome sight in a storm, and a guide past treacherous rocks, reefs, and shoals, just as it was when hardy keepers maintained the lights. Even if most went dark years ago, and if souvenir-hunters, seagulls and the elements have had their way, lighthouses and their foghorns, many of which continue to call out into the gloaming, still take hold of our hearts. Growing up near the southern shore of treacherous Lake Erie but too far away to see a beacon, I could hear a foghorn’s rhythmic bellow every time skies turned soupy, which was often. I imagined giant ore boats plowing through the windswept chop toward port, saved from destruction by those low, mournful horns. Romance attends lighthouses, the sentinels of the sea. “For my husband and myself, Lighthouses are symbols of Faith, Hope, and Love,” writes Debbie Dolphin on her “Lighthouse Songs” Web site. I don’t know if that’s her real name, but it’s a fitting one. The god Prometheus was one of the Greek titans, and a naughty one. He stole fire from Zeus and shared it with humans. In ancient Greece and elsewhere, humans lit beacon fires on the shoreline to guide navigators. “GLEAM — a gleam — from Ida’s height /By the Fire-god sent, it came,” the playwright Aeschylus wrote in Agamemnon, more than 2,000 years ago. And Roman galleys sometimes carried baskets into which fires were built as signal lights. 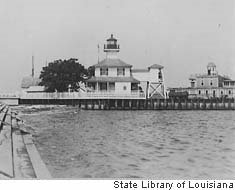 They were the first “lightships” or lightvessels, crude forerunners of a fleet that the U.S. Coast Guard moored in waters too deep for a traditional lighthouse. Civilization’s first known lighthouse was a doozy. Instantly the world’s tallest building at what is thought to have been 40 modern stories high! It was built of stone about 280 B.C. on the island of Pharos off Alexandria in Greek-ruled Egypt. 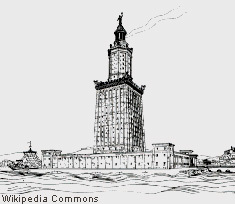 “Pharos” became the root word of “lighthouse” in several languages. Considered one of the Seven Wonders of the Ancient World, it used mirrors to reflect firelight at night and rays of the sun in the daytime, far into the Mediterranean Sea. Earthquakes toppled the great tower in the 14th century A.D.
Wood fires illuminated other early lighthouses as well. Arrays of candles arranged in tiers, and coal in brazier pans, were also tried. Then came whale- and fish-oil lamps, which produced a terrible stench. 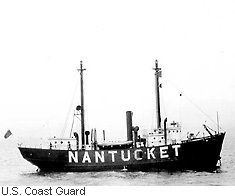 Even worse was colza oil from rapeseed, which, Scott Stanton once told me, “smelled like cooking cabbage.” Stanton was a Coast Guard boatswain’s mate who was one of the keepers at the Guard’s last staffed station at Boston Light in that city’s harbor. 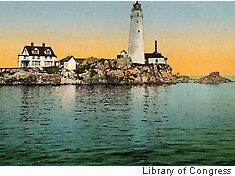 This was also America’s first lighthouse, erected by the Massachusetts Bay Colony in 1716. There is good reason for the old lighthouse saying that “there is no such thing as a fat keeper.” These men — and women who often inherited the job when their husbands drowned, died, ran away, or went mad — had to haul oil up the tower’s twisting stairs in huge cans. Twice a night, sometimes in raging storms, deep fog, and icy mists, they trudged up to reset the optical mechanism. 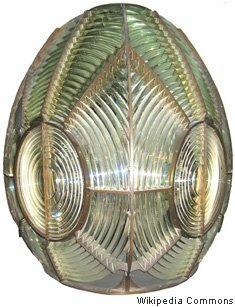 There were wicks to be trimmed and lit — hence lighthouse keepers’ “wickies” nickname — reflectors to be polished, soot to be cleaned from lenses, and the fog signal to be maintained. 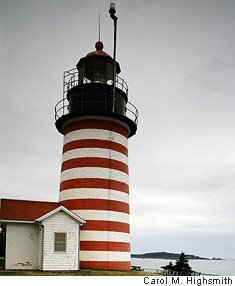 Because of the importance of lighthouses in daytime as well as at night, they also had to be kept freshly painted in a variety of distinctive patterns. And when mariners foundered nearby, the lightkeeper felt duty-bound to rescue them. Dozens died trying. You can see why a powerful light generated inside a Fresnel lens would scatter far and in many directions, especially if the lens rotated. Looks like an alien’s head, doesn’t it? French physicist Augustin-Jean Fresnel revolutionized the lighthouse in 1822 with a system that took advantage of the refractive properties of glass. The Fresnel lens bent a single light source inside a beehive of glass prisms into powerful sheets visible up to 35 kilometers — 22 miles — away. 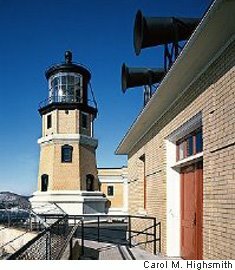 The old U.S. Lighthouse Service, which staffed the nation’s light stations for 29 years beginning in 1910, designed a different signaling pattern for each and every light. Observing the idiosyncratic flashes and unique markings of each lighthouse, sailors had a pretty good idea where they were, and which rocks and sandbars to avoid. In 1939, President Franklin Roosevelt, concerned about wartime readiness, placed light stations under Coast Guard control. 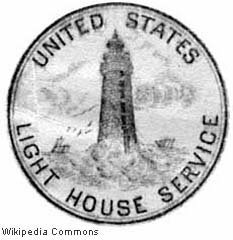 It spelled an end to the Lighthouse Service and to the staffing of most towers. Even the sturdiest of lighthouses could not survive all of the ravages of nature and man. Some have succumbed to relentless erosion. Ice floes took out others. Earthquakes, too, as in Egypt. Before park services and historical societies came to the rescue, the Coast Guard rapidly decommissioned lighthouses, leaving them to whatever fate might befall them. As I’ve mentioned, it was open season for pranksters, pyromaniacs, and vandals. 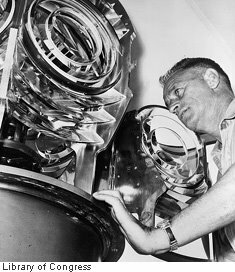 America’s shorelines — including the “North Shore” along Fthe five Great Lakes in the Midwest — Fresnel lenses were brought to a depot on Staten Island, New York, where they were assembled for shipment to light stations around the country. Abandoned in the 1960s, the depot complex sat idle until 1999, when the site, with a spectacular view of Manhattan, was selected over several other bidders as the home of a new national lighthouse museum. 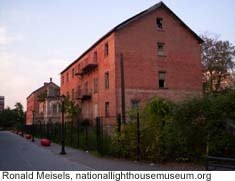 Sadly, despite millions of dollars in state and city funding used to stabilize the old storehouses and lamp shop building on the Staten Island site, the museum has never opened. Developers, too, you see, have an eye on this prime property. Each lighthouse is its own treasured historic curiosity. 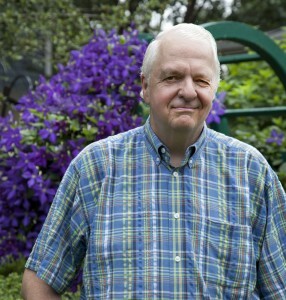 The towers’ austere beauty, keepers’ lonely stories, and fanciful tales of lighthouse hauntings have inspired books and poems, paintings, collectible ceramic miniatures — Richard Moe, the head of the National Trust for Historic Preservation, for instance, collects them — lighthouse license plates, and postage stamps. Some people who love lighthouses even more than I do have purchased them and turned them into remarkable bed-and-breakfast inns. Other light stations remain endangered despite the good efforts of reverent local lighthouse societies, but our affection for these beacons in the night shines brightly. Held high above the dusky sea. Had this been 1974 instead of 2009, my editor, “Hawkeye Rob” Sivak, could have been, well, just an editor, vigilantly sprucing up my copy and others’. This is not our Inventory Control Officer, but it looks suspiciously like the kind of work he has in mind. Please tell us he’s not going to be recording the barcodes on stashes of BEER! He’s been dragooned into the ignominious additional role of English Features Branch Inventory Control Officer. As such, he’s been making the rounds, mostly electronically, imploring us to dig through our suitcases, equipment bags, and file-cabinet drawers to lay hands on each and every VOA-owned digital recorder and camera, laptop computer, TV clam and the like. Since I’ve been spared the rigors of television work, no doubt because of the lumpy cut of my jowls, I can tell you only that a “clam” is an ominous-looking device that opens and shuts like the bivalve, gobbling and expelling little cassettes on command. The search is not so much for the equipment itself, but for the number on a sticker that someone had affixed to it when it was issued. For Inventory Control, remember. On each sticker is a parade of 30 black and 29 white, thick and thin, machine-readable lines, all in a row. It’s a . . . what would you call it? An arrangement of lines that looks like bad wallpaper? A tiny version of an old television test pattern? An optical Morse code? 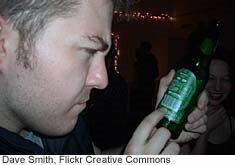 Whatever it is, it was introduced in 1974 and is usually written as one word, “barcode,” to distinguish it from bar codes having to do with proper dress and the legal drinking age. The barcode’s groupings of lines — thick, thin, white, black — together form a computereze number, plus the number in the usual numeric form just below it. Electronic scanners can read the lines, and humans with really good eyesight can read the numerals. If you’re keeping up with this, you’re a geek. Here’s more, not that you’ve asked for it, but something to bring smiles to the faces of M.I.T. engineering students and Inventory Control Officers: Some of the digits, diabolically, are read right-to-left and others left-to-right. Not only that, but some of the stripes align black-white-black, and others white-black-white. Or something like that. It’s a Control thing. The whole 12-digit number is called a Universal Product Code or UPC number. It’s what Hawkeye Rob is looking for, high and low, throughout the corridor. Thirty-five years ago, Rob the Much Younger Inventory Control Officer would have had to write or type a list of our broadcasting gadgets, describing them, stating who possessed them, and assigning each a “control number.” There must be control, I remind you, in the Inventory Control business. Now he just needs the UPC Code. It knows all about each device and an awful lot about the person who possesses it. 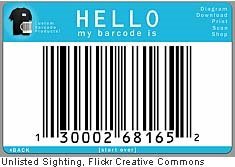 In a short but glorious history of the barcode, New York Times writer Gerry C. Shih noted that barcodes are scanned 10 billion, with a “b,” times a day around the world. They’ve come a long way since the first one was slapped on a pack of Juicy Fruit chewing gum on June 26, 1974. Indeed, barcodes’ first application was as inventory control — that term again — of products sold in grocery stores. Barcodes brawling. That would have been something to see! 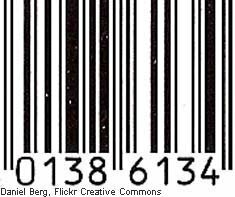 The barcode was developed at I.B.M., which for some reason never patented the idea. So now they’re everywhere. Barcodes run amok! I see the initials “UK.” What are those wily Brits up to now? But they’re not free. Manufacturers pay a small amount to a company called the Uniform Code Council, which controls — that word again — the assignment of numbers. This makes sense. Can you imagine what would happen to scanners and Inventory Control Officers if you and I and Aunt Tilly could arbitrarily dream up and assign whatever barcode we felt like on our own? 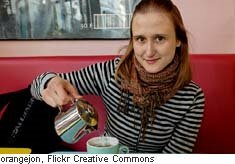 No, every code and every UPC number is controlled — yes indeed, controlled — and unique. That should make that pack of radishes at the supermarket really proud. When barcode scanners do their thing, they’re actually performing a calculation. (Most of you who have hung in this long will be leaving us now.) According to Marshall Brain — and what a perfect name for this — on the “How Stuff Works” Web site, the scanner adds the value of all the digits in odd positions, multiplies that number by 3, adds the value of the digits in even positions, adds that sum to the values in step 2, then somehow creates a “check digit” that tells it whether it did all that correctly. What have we here? Two barcodes: one on the painting and one on the girl? Not surprisingly, when barcodes were first introduced, freaked-out customers and civil libertarians suspected a government plot to track our every move, or at least our every purchase. 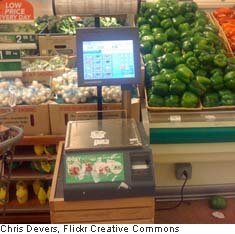 Now that we’ve made our peace with barcodes, cost-conscious store owners have put us all to work, scanning our own tomatoes and canned soup at many checkout lines. Barcodes are used for much more than Inventory Control, however. You betcha! Stores don’t just want to know how many boxes of spaghetti remain on a shelf, and scan in new shipments as they arrive. They also want to know what brand of spaghetti each customer prefers, and what other ingredients we buy on the same shopping trip. So don’t be surprised if, at the end of check-out, the scanning device prints out discount coupons for precisely the products you’ve just purchased, and for similar products that competitors make as well. The store might even send you a note at home that begins, “We know you love Mama Randonzo’s Spaghetti, so we thought you’d like to know that Mama Randonzo has come out with three new flavors.” All because the barcode scanner ratted on you to the store manager. No wonder we’re all fearful that the Inventory Control Officer’s maraudings are but the first step down a slippery slope. Next he’ll be barcoding our stories, substituting the white and black lines for bylines so that viewers, listeners, and readers can instantly scan our life stories, our previous writings, and our product preferences at the grocery store. Then Hawkeye, having moved to Inventory Control fulltime, will stop by unannounced to barcode our coats and hats, eyeglasses and coffee mugs. Since he will then have little else to do, I will ask him to barcode our lunch boxes and bags and soft drink cans, while he’s at it, with a code that matches our ID badge. Then some sort of secret alarm could be rigged to sound the next time someone absconds with my macaroni and cheese from the lunchroom refrigerator. Finally, in a blaze of glory before he retires, Hawkeye Rob can tattoo all of us with barcodes, discretely on the hand or nape of the neck. It would be the ultimate tool for tracking VOA assets, assuming we’re still regarded as such. 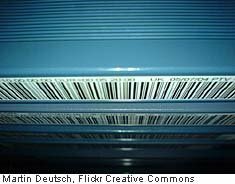 The Federal Government conducts an annual “Human Capital Survey” for which burned-in barcodes could come in handy. Back in 1974, a fellow named George Laurer, who’s now 84, led the team that developed the first barcode. See what you wrought, George? Abscond. To run away quickly, usually with someone or something. Escaping prisoners are absconding, but they are really absconding if they take, say, the jailer’s keys with them. Doozy. A doozy is something that is really difficult, or something that’s extraordinary or extreme. Dragoon. To obligate or bully one to do something, perhaps by force. Dragoons were French soldiers who sometimes compelled peasants to leave the farm and join the military. Pyromaniac. One who compulsively starts fires; a firebug. The word derives from the word “pyre,” which refers to a roaring fire. Rat on. To turn you in or inform on you. Sometimes communities try to encourage citizens to tell authorities about lawbreakers, but those who do can be regarded as “dirty rats,” or worse, on the street. Refractive. Reflection bounces back light. Refraction bends it or changes its direction by passing it through a medium like glass. Widow Walk (or Widow’s Walk). An observation platform above the roof of a house near the sea. It’s called “widow’s walk” because many a seafarer’s wife has paced on this platform, watching in vain for her sailor to return from a voyage.